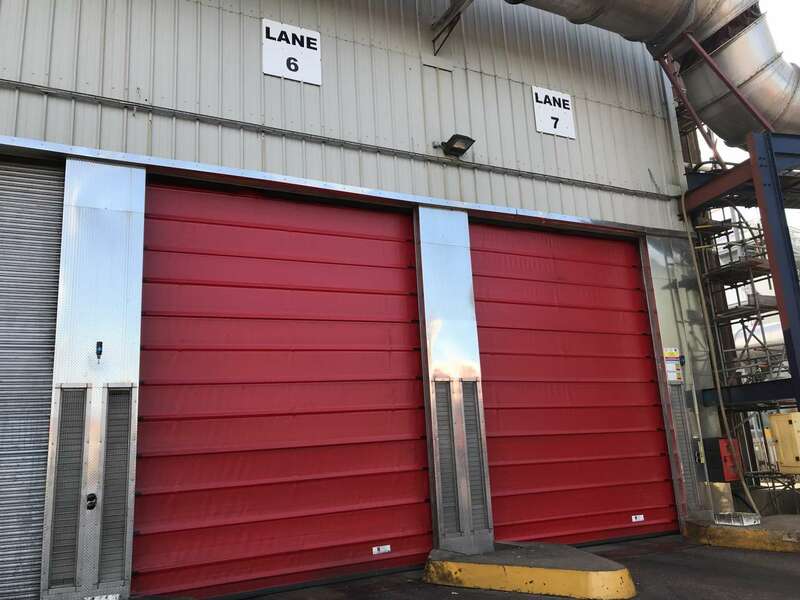 The team have recently installed a number of new high speed doors to a client in the food sector with facilities in the Nottingham area. Enabling them to comply with all there DEFRA requirements, while also giving them easy, efficient and controlled access. This particular set of doors had a number of needs. Firstly and their most basic function, they needed to be high enough to allow easy access to tipper trucks, but also have the facility to have the doors only open partially to allow entrance on foot without opening to their full extent. Additionally they were also interlocked with interior doors giving controlled access and atmospheric control. Plus for more efficient traffic flow and increase productivity, induction loops are fitted to allow the doors to automatically open when approached by a vehicle. For any industrial door needs, from high speed doors to industrial roller shutters, do not hesitate to get in contact. em to comply with all there DEFRA requirements, while also giving them easy and efficient access and maximizing their production facility. This particular set of doors had a number of needs. Firstly and their most basic function, they needed to be high enough to allow easy access to tipper trucks, but also have the facility to have the doors only open partially to allow entrance on foot without opening to their full extent, limiting. They were also interlocked with interior doors giving controlled access and atmospheric control. Plus for more efficient traffic flow and increase productivity, induction loops are fitted to allow the doors to automatically open when approached by a vehicle. Due to the size of the doors they are strengthened with steel tubes to stop any bend in them giving easy operation particularly in windy conditions. They can come in a variety of colours to fit in with the building aesthetics.